The Pecan Industry's Leading Publication. The Texas Pecan Growers Association (TPGA) is a nonprofit, educational association whose mission is to assist Texas pecan growers in growing pecans profitably through education, research, and promotion of consumption. 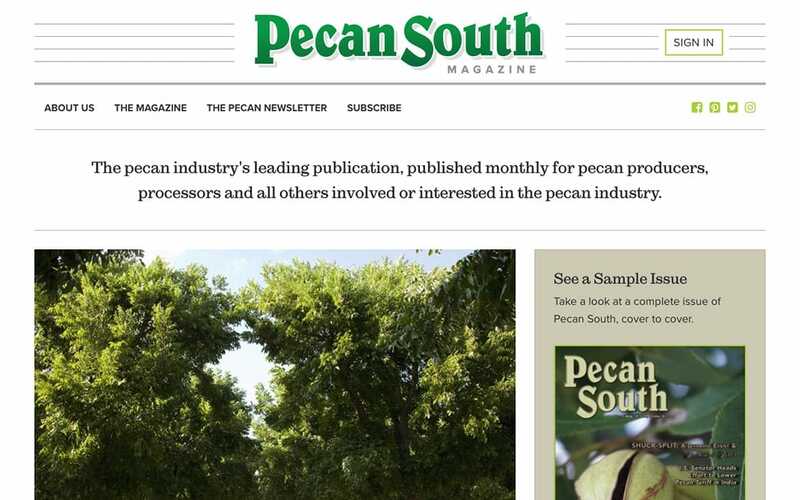 TPGA publishes a monthly magazine, Pecan South, which is distributed by subscription both nationally and internationally to a number of foreign countries. 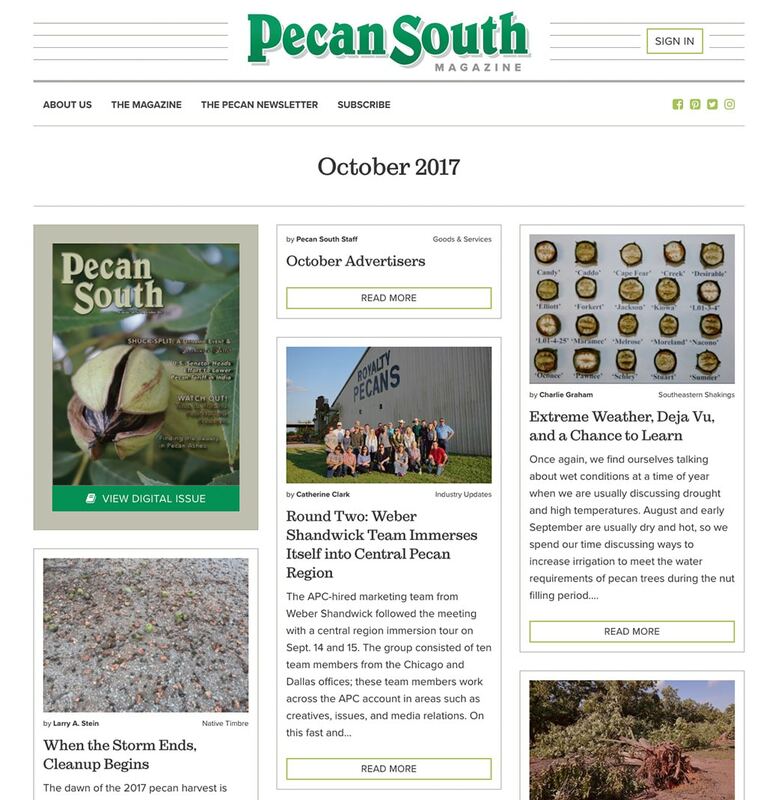 TPGA also publishes The Pecan Newsletter each fall during the harvest season to keep growers updated on current market conditions. A new site was needed to allow users to better preview the magazine before purchasing a subscription online, and to attract advertisers to see the value in the content that made their community unique. Their old site was not mobile friendly and the design was dated so it didn’t allow for a fully immersive experience like a magazine should. We created a site that was both partially available to the general public and mostly behind password protection to encourage subscriptions and advertisements. We also developed some additional features to allow users to search through their deep history of articles, submit a classified ad, purchase a back issue, purchase the paid newsletter, and manage their subscriptions. Who knew there is a whole community dedicated to the well being of pecans? We sure didn’t, but we were excited to jump in to help them solve their unique problem of attracting new readers to their magazine online. 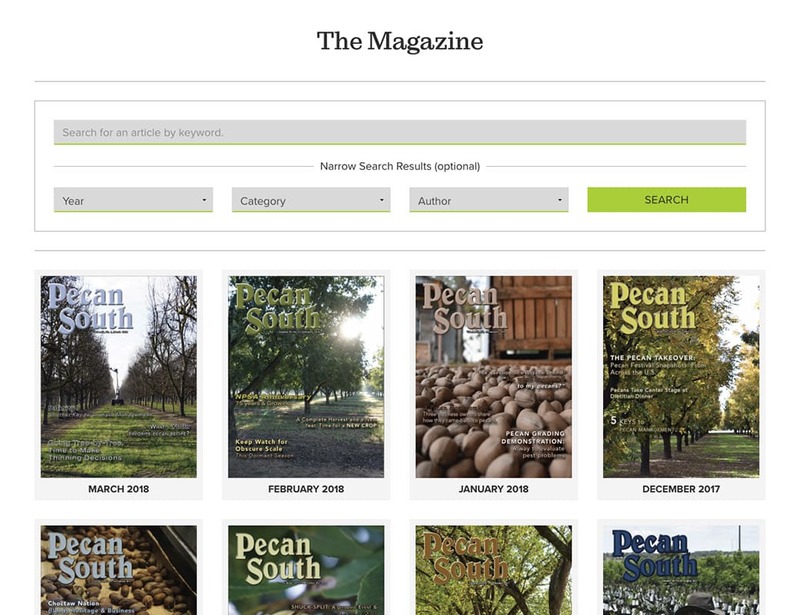 When you visit the Pecan South Magazine home page you will see the option to ‘See a Sample Issue.’ What this does is give the viewer a complete view of how the entire site is structured. 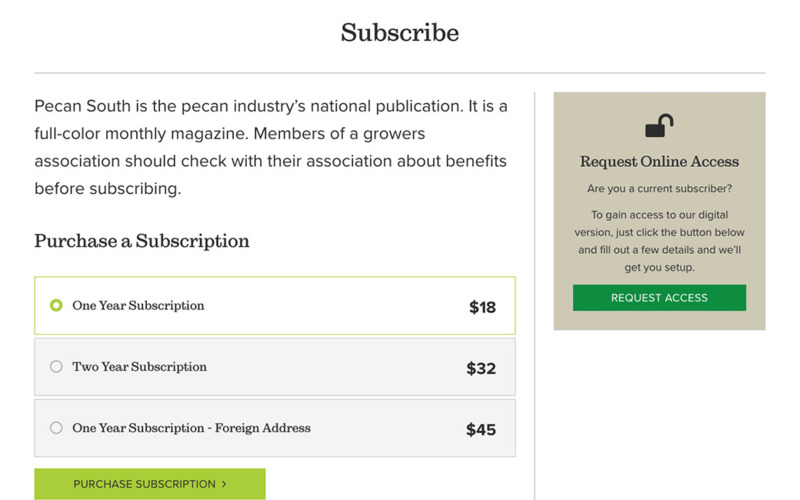 It allows new visitors and potential subscribers to get a taste of what the pecan world is all about without having to purchase just yet. We also included a digital issue which is an interactive flipbook that mimics the flipping pages of a real magazine. It’s very easy to navigate and gives the users the option to casually turn each page as it is laid out in the actual printed version. This is also very easy for the client to manage. To enable this feature, we leveraged Flipsnack digital flipbook maker to transform a PDF into an online flipping book and added custom fields to the WordPress admin to support the integration. The client can add this feature to every issue with a simple copy and paste. Another way we structured the site to entice readers was through the robust search section we developed for the magazine. Users can either click on an issue they are interested in or search the entire online catalog by year, category, or author to narrow articles down to topics they are most interested in. This view is available whether you are a subscriber or not. The only catch is, you must be a paid subscriber to read full articles. This method of discovery allows users to be engaged by the full functionality of the site without immediately sending them away. 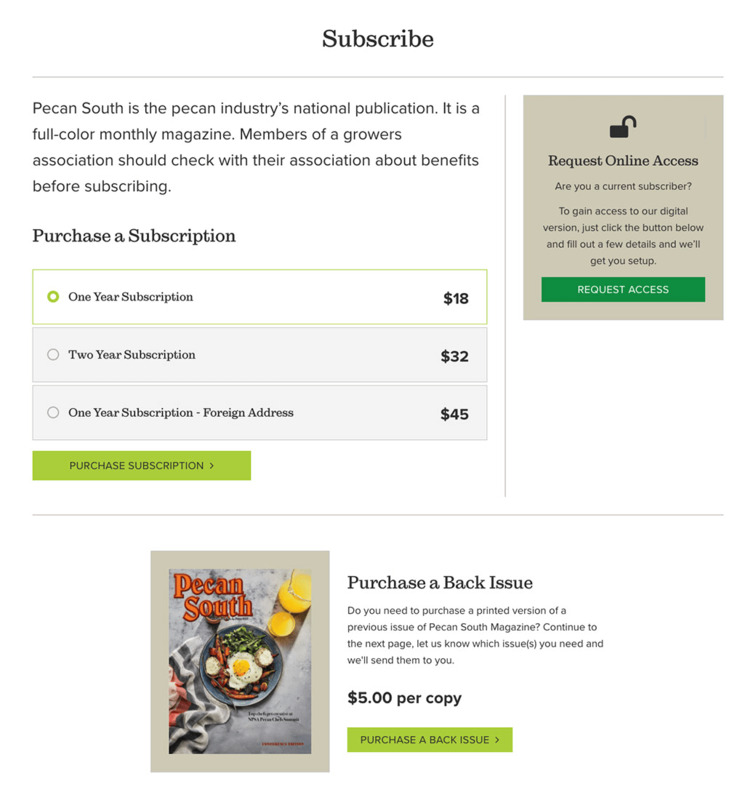 However, only those who have a valid login and subscription can access the full value, tips, marketing guide recipes, and other goodies Pecan South Magazine has to offer. When you think about ecommerce integration you might think of a web store that sells products or services. For a magazine, it’s very similar. 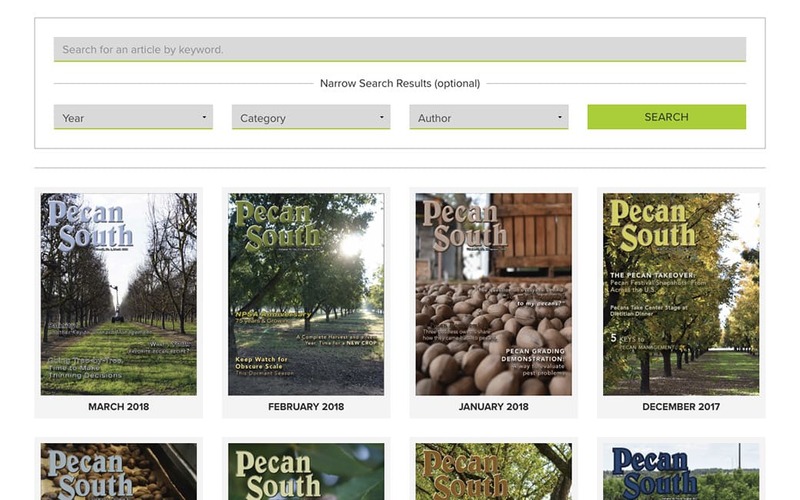 Pecan South Magazine did have a couple of unique challenges and workflows to overcome in order for us to integrate the ability to take payments for subscriptions, set up accounts for users who purchased offline, and give all users the ability to purchase a hard-copy back issue as needed. We integrated WooCommerce plugins for payments and purchases while leveraging WooCommerce Memberships to manage ongoing subscriptions. These plugins are very powerful at solving many pain points to help us rapidly develop the necessary tools and workflows that are common to ecommerce setups. Users expect a seamless experience when it comes to payment processing and that’s what we delivered here. 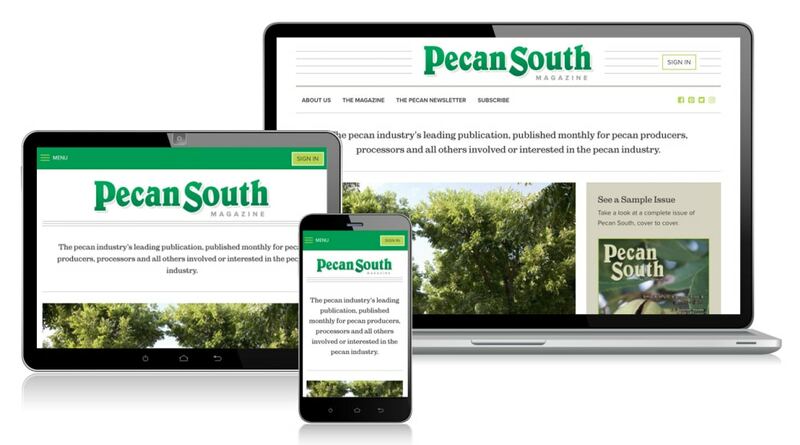 Sometimes smaller features get overlooked when you have a site full of great content like Pecan South Magazine does. Well, to truly pull it all together you can’t forget to plan out how a user will interact with even the smallest details. Site Security is Very Important! Site security and SSL certificates are a must have when dealing with transactions online. To ensure maximum site security, we enabled an SSL certificate and forced HTTPs across every page on the site. Web users can trust that their personal and credit card information will be kept safe throughout the purchasing process. To read more about SSL certificates take a look at our SSL Everywhere initiative to help you secure your site. 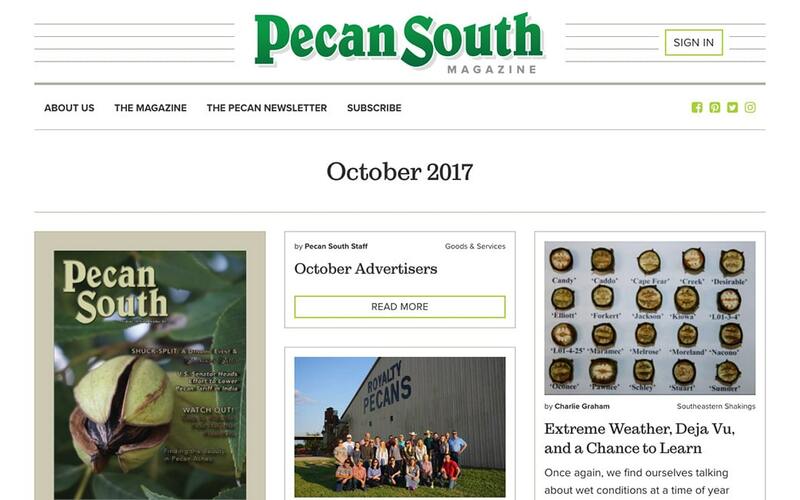 Pecan South Magazine also offers a paid newsletter each fall during the harvest season to keep growers updated on current market conditions. It’s a unique supplement to the magazine with a big payoff for growers to stay involved each season. Since we have a subscription model in place it was easy to leverage that tool to help manage. Each paid subscriber can login and easily view and manage their subscriptions, payment history, address information, and account details. It’s a small detail but we always make sure users have access to details that matter the most. On the advertise page we added a contact form to allow users to get in touch if they have questions. We also allow users to submit a classified ad by submitting their ad details and information directly on the submit a classified ad page. Most recently, we integrated their site with Google AdSense, so staff can now display ads on their website while still leveraging the full features of Google’s leading Ad service. You may be wondering how we accomplished building this amazing website. With our WordPress know how, custom theming ability, and extensive plug-in knowledge we are able to quickly pull it all together. We’ve been around the block with WordPress for quite some time and this one was a really fun project to work on. We started with wireframes to figure out the unique challenges, designed the look and feel in-house, and developed a custom theme to give our client a tailored WordPress experience and content management system to suit their specific needs. Having a website that includes a mobile-friendly experience is crucial to your success. We used our custom framework we developed which includes popular responsive web development techniques, allowing for an enjoyable reading experience for users no matter what device or screen size they are viewing the site on. For Pecan South Magazine we made sure to pay special attention to font sizes and clearing the clutter. This allows users to focus on content without distraction and allows them to better absorb the content they are reading. Overall our client was very happy with the final outcome of the entire site. The improved visibility of articles for their readers brings much more value when each magazine is published online. The site navigation easily allows users to find new topics, archived articles, and issues in a much more logical fashion. We’re very proud of their new website and happy to support the pecan industry in such a meaningful way. Catherine Clark Pecan South; Texas Pecan Growers Assn.